Trudi Wrote: "I thought I'd share a crafty tradition I started with my kids last St. Patrick's Day. We took water balloons and blew them up with air. 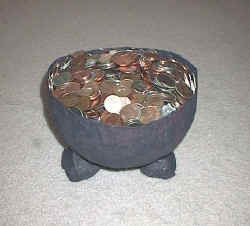 We covered them with play dough (you could use any fast drying clay) to make the shape of a pot (of gold) and put three balls of dough on the bottom for feet to keep the pot from rolling around. We let the outside dry a while then popped the balloon to let the inside dry. Once dry we painted it black and set it out on March 16th before the kids went to bed. The leprechauns visited through the night and filled it with gold coins (foil covered chocolates or loonies in Canada) A variation could be a treasure hunt for the hidden coins (like an Easter egg hunt). They loved it and saved the pots for this year." Thanks for the idea Trudi. I hope you don't mind that we adapted your idea a bit by using paper mache. 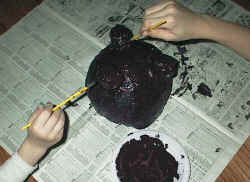 Prepare your paper mache paste (read my "How to Paper Mache" Activities if you don't know how this is done. Blow up the balloon to an appropriate size for your pot of gold. Ours was slightly smaller than a soccer ball. Draw a line around the middle of the balloon to use as a guide when applying the paper mache to your balloon since you only want to cover half of the balloon. Stick the knotted end of the balloon in a small bowl so that it does not roll around on you while you are applying the newspaper strips. Apply about 3 or four layers of newspaper strips to half of the balloon. 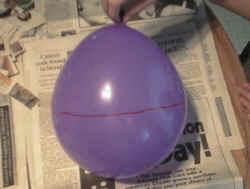 Be very careful not to get any paste on the half of the balloon that is not being mached. I actually washed the other half of the balloon with a damp cloth at the end. Any paste on the bare part of the balloon will pull as it dries and will likely cause the balloon to pop before the newspaper is dry. Take about 1/4 of a page of newspaper and roll it into a ball. Dip it in the paper mache paste and roll it more. 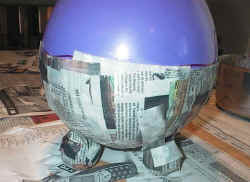 Add a few short strips of newspaper and paste until the ball keeps its shape. Repeat two more times so that you have three feet. Arrange the round feet on your newspaper covered table in a triangular pattern. Set your balloon on top of the feet and then secure as best you can with short narrow strips of newspaper and paste. We will spend some time making the feet more secure later. Do not burst the balloon yet. Apply a few more layers of newspaper and paste paying particular attention to secure the feet to the bottom of the pot. Let the project dry and then you can repeat a third time and fourth time if you wish your pot to be more durable. Remove the balloon by cutting off the knot. This will allow the balloon to deflate slowly and is less likely to damage the craft than if you were to burst the balloon. Paint the paper mache pot black.